Fashion is not everybody’s cup of tea, some of the styles and trends are baffling and insane, to say the least. And some international brands very easily fall prey to some ruthless memes and jokes, all thanks to some utterly weird attires. 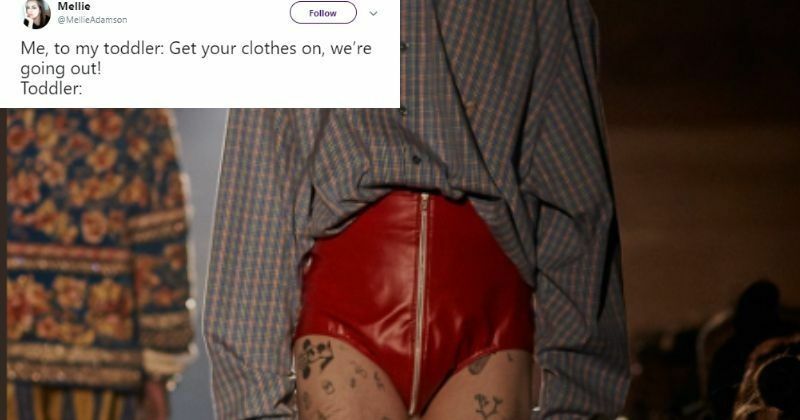 The latest brand to get caught in Twitter’s ‘troll-a-thon’ is Gucci. A picture of a male model walking down the ramp in red vinyl shorts with a silver zipper on the front left many baffled. We agree that the fashion world has some sort of a license to go a little crazy, but seriously, this look is not something that people will go for IRL. Nobody wants to take that kind of a risk really. And so the floodgates to hilarious memes and jokes opened on the microblogging site. Even Omar Abdullah was confused by this extra quirky style.